The ‘pop-up’ shops are dedicated to the versatility of the design classic. Contract furniture finally has its own pop-up. 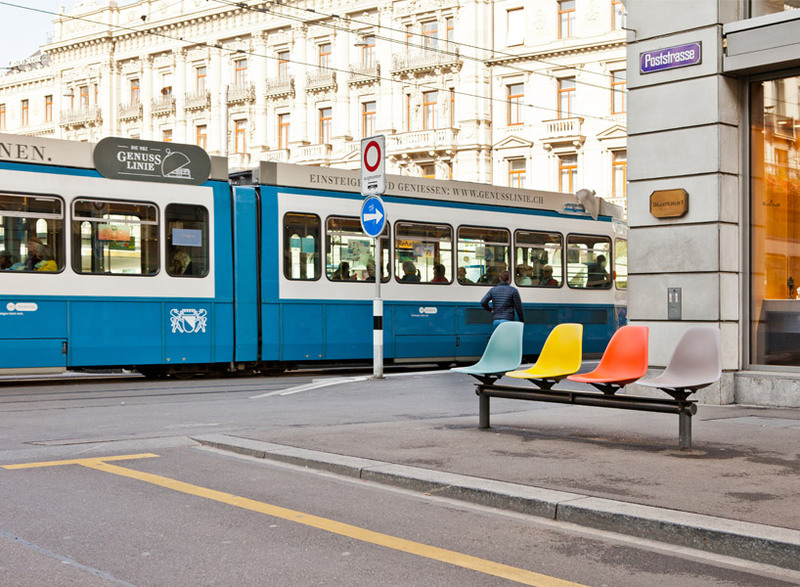 This fall Vitra will open two "pop-up" stores in Zurich, Switzerland and Amsterdam in the Netherlands. The stores will celebrate the versatility of the iconic Eames Plastic Chair designed by Charles and Ray Eames. The temporary stores will welcome visitors into an almost shrine-like experience where they will be able to configure their own personal versions of the chair. Buyers will be able to mix and match 14 different armchair and side chairs shells with a wide assortment of bases, colors and upholstery options. The VITRA ‘pop-up’ stores use a hybrid retail approach to their dedication to the ‘eames plastic chair’. alongside the physical shopping displays, which can be a source of inspiration. Digital elements are embedded to enhance the customer experience. large touch screens, as well as tablets, can be used by shoppers to configure their own product. these are then connected to the brand’s online shop to allow access to more than 100,000 different compositions, and enable order placing.